Space to roam. It is a must for the world’s largest land animal, but across the transboundary Kilimanjaro landscape straddling Kenya’s southern border — known for its sizeable elephant population — that roaming space is becoming harder to find. This essential landscape is home to diverse wildlife species, many of which migrate seasonally. Within Kenya, it covers the Amboseli ecosystem composed of Amboseli National Park and seven Maasai group ranches. On the Tanzanian side, it comprises the protected areas of Mt Kilimanjaro and Arusha National Parks, as well as Lake Natron and Ngorongoro Conservation Area. Further east, the Amboseli ecosystem connects to the Tsavo landscape, comprising Tsavo East, Tsavo West, and Chyulu Hills National Parks in Kenya and Mkomazi National Park in Tanzania. As commercial agriculture gains a foothold in this traditionally pastoralist Maasai region, farms and growing settlements increasingly obstruct the paths of elephants and other wildlife moving across vast rangelands in search of food, water, and other resources. The increased chance of contact puts more people at risk of losing life and property to wildlife. For the elephants trampling farmland or lions attacking people or livestock, retaliation by communities can take various violent forms — some wild animals do not survive. At the same time, overgrazing around wildlife areas is degrading dispersal zones while excessive irrigation is depleting the wetlands in the ecosystem. 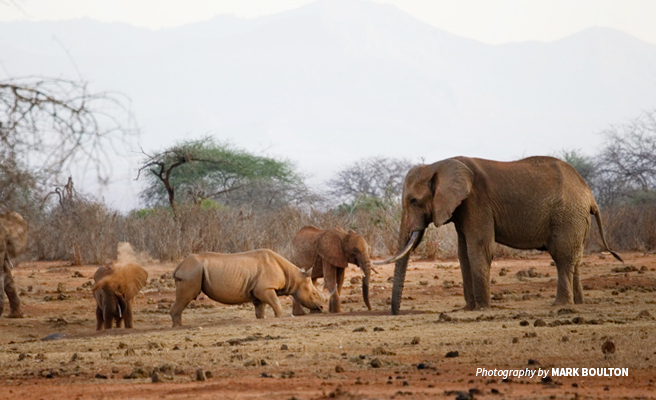 AWF began working in the Kilimanjaro landscape in 2000. Our first priority: secure corridors for wildlife to move safely between ecosystems. We achieved this by facilitating the formation of conservancies through a revolutionary land-lease program that provided annual payments to landowners to keep land open for wildlife. To sustain the benefits of biodiversity protection, these community-owned lands are primed for sustainable tourism development which provides alternative sources of revenue. Another critical aspect of this effort included enhancing cross-border security. AWF coordinated regular wildlife security cross-border meetings so that Kenya and Tanzania wildlife and parks authorities, government officials, representatives and scouts from conservation areas, as well as partner organizations on both sides of the border could discuss challenges and find solutions. Across the Kilimanjaro landscape, villagers are encouraged to join in wildlife monitoring and conservation as community scouts. 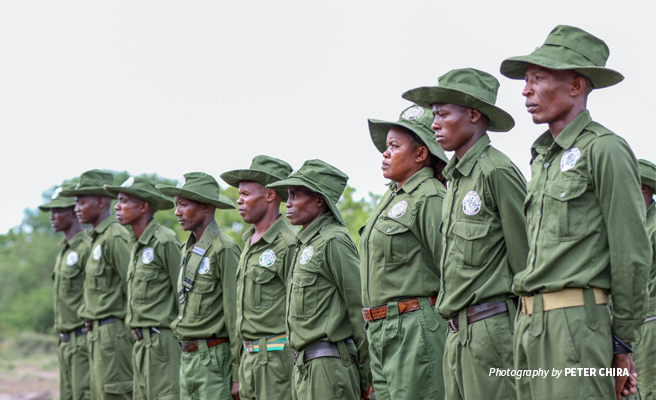 Selected by local councils in group ranches and wildlife management areas, the scouts are trained by AWF and other partners to conduct monthly cross-border joint patrols alongside rangers from Kenya Wildlife Service, Tanzania National Parks Authority, and Tanzania Wildlife Authority. With intelligence-led patrols and strategic ranger outposts in high-risk areas protecting wildlife from poachers plus community measures to mitigate human-wildlife conflict, the elephant population in the Kilimanjaro landscape has remained stable and secure. But good news in the Kilimanjaro landscape meant bad news in the broader ecosystems southeast. The presence of wildlife rangers and scouts in Kilimanjaro led poachers to move their operations to the Tsavo-Mkomazi ecosystem — the porous international border made it easy for them to flee and escape the law. We provided financial and technical support to the Kenya Wildlife Service-operated Ngulia Rhino Sanctuary in Tsavo West National Park, helping the critically endangered eastern black rhino population grow from just three to over 100 currently. However, human-wildlife conflict still represents a significant threat to communities across the landscape, especially in the areas used by elephants and other migratory species moving between Kilimanjaro and Tsavo. 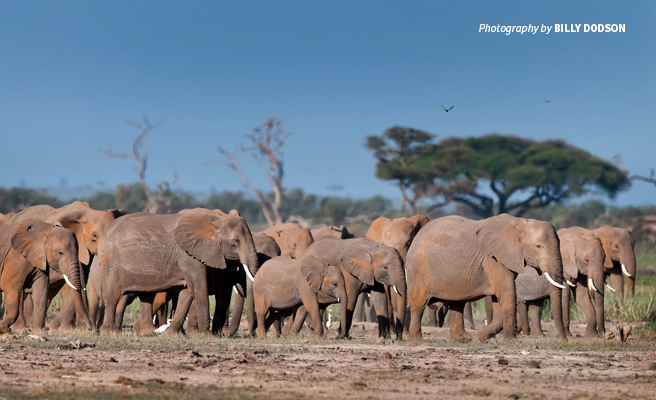 AWF decided to expand upon our successful anti-poaching work and engage local communities in biodiversity protection. The key was to empower communities to protect their crops from elephants. In collaboration with government entities, AWF trained hundreds of Kenyan and Tanzanian farmers, wildlife scouts, and rangers in human-wildlife conflict mitigation. The training provided wildlife-friendly tools to keep elephants out of fields. During the day, villagers scare off elephants using the vuvuzela, a simple, and very loud, plastic trumpet. After dark, LED flashlights are used to ward them away. Where damage by wildlife is not prevented, a compensation program provides some level of financial reparation. Thanks to the training, farmers can handle incidents without calling wildlife authorities to help them, leaving rangers more time to focus on severe poaching-related issues. The proactive conservation measures are keeping communities safe — in villages that received training, wildlife attacks on human settlement dropped by about 20 percent, and farmer harvests gradually grew. As in Kilimanjaro, AWF also initiated quarterly wildlife security meetings involving wildlife authorities, local government officials, conservancy managers and, other players from Kenya and Tanzania. In addition to joint cross-border patrols and shared intelligence, there are plans to bring more poachers to justice with additional judicial and prosecutorial trainings. Our collaborative approach secures a future for the people and wildlife of this essential ecosystem. Sylvia is a Species Conservation Project Officer at AWF. As a trained conservation ecologist, she gained on-the-ground experience in the Conservation Leadership and Management Program and continues to sharpen her interest in environmental planning, illegal wildlife trade, species conservation, and environmental governance.